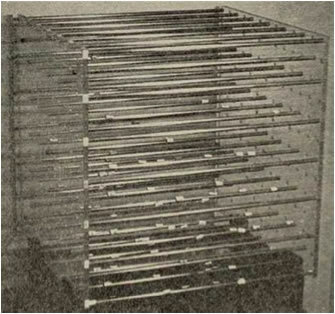 Initial Sphere determing apparatus that Dr. Hansen used. 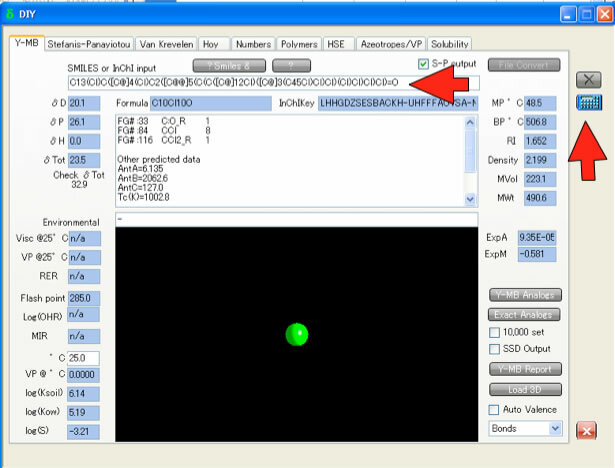 If we use Hansen Solubility Parameter(HSP), we can easily find solvents for polymers. We explain this procedure briefly. A lot of researcher try to use Hildebrand solubility parameter for this purpose and fail because Hildebrand SP will predict resolvability less than 60%. If you use much and much solvents the percentage of success will going down. The reason is very clear. The Hildebrand SP is based on just Heat of vaporization, so if the Heat of vaporization is very near even though chemical structure is so different, Hildebrand SP become same. For example, the Hildebrand SP of Ethanol and Nitroethane is almost same. But every chemist feel strange if they hear solubility of Ethanol and Nitroethane is same. On the contrary, Hansen Solubility Parameter divided solubility energy into 3 parts. Those are Dispersion(dD), Polarity(dP) and Hydrogen bonding(dH), and we treat this 3 terms as vector. 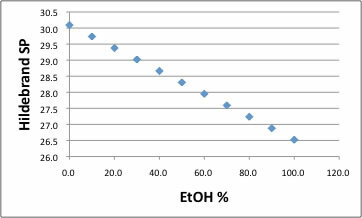 We show you 3-dimensional chart of Hansen Solubility Parameter of Ethanol and Nitroethane. Hansen Solubility Parameter and Hildebrand SP has relationship of following scheme. 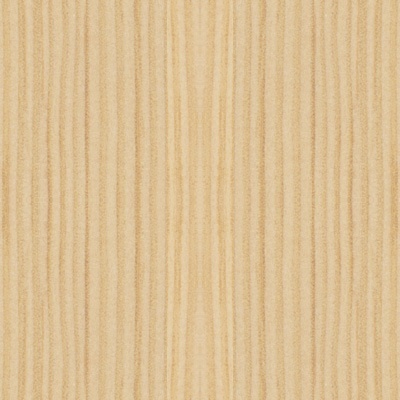 So Hildebrand SP is the length of Hansen SP vector’s length. 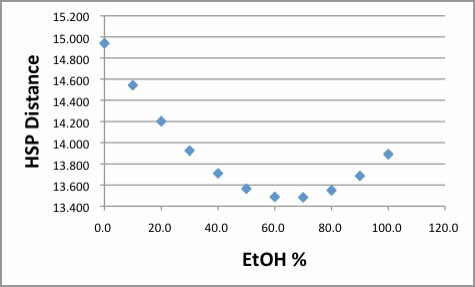 The chemist easily understand the difference of solubility Ethanol and Nitroethane with this 3D chart. Solubility parameter basic concept is “likes dissolve likes”. 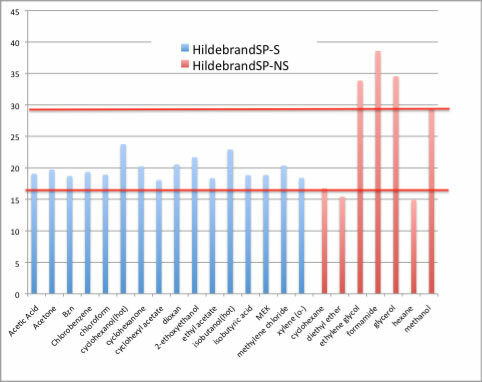 So Hildebrand SP is not adequate to search polymer solvents. Our concept is “likes vectors dissolve likes vectors”. This concept help us to search polymer solvents dramatically. The percentage of success predict resolvability become more than 90% with Hansen Solubility parameter method. We need to confess one trick when we say “more than 90%”. 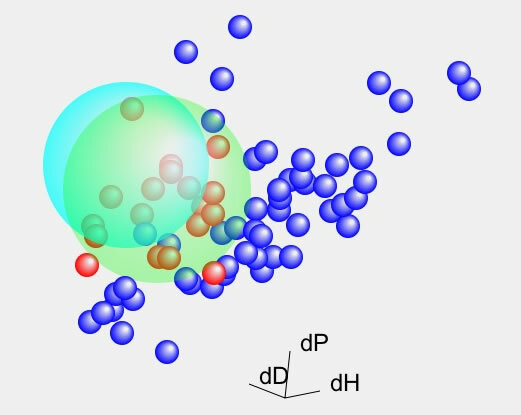 We introduced Interaction Radius(R0) concept into solubility search for polymers. 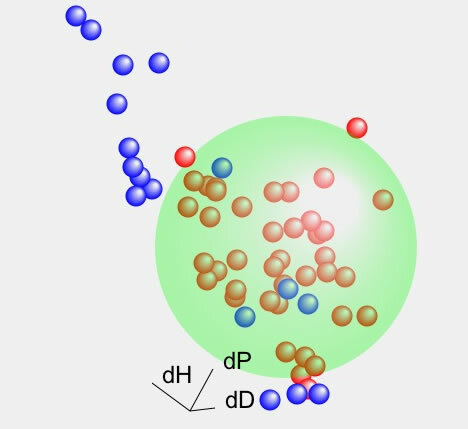 If you are experimental polymer chemist, then this Interaction Radius(R0) concept is very very familiar. Some polymer like PPG(poly propylene glycol) will dissolve almost all solvents and Some polymer like highly fluorinated polymers will dissolve almost no solvents. 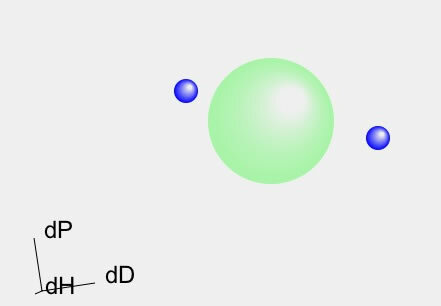 The Interaction Radius(R0) set very large for PPG and very small for highly fluorinated polymers. With this technique, we can say “more than 90%” success. Once you get HSP of polymer and Interaction Radius (R0), then things become very easy. If you want to evaluate new solvent, you just get Hansen solubility parameter(HSP) of that solvent, and calculate HSP distance (Ra) from polymer HSP. If the distance is shorter than interaction radius (R0) then that solvent will dissolve that polymer with very high possibility. Let’s calculate with existing example of Polymer Handbook 4th Ed..
At that section, good solvents and poor solvents for many polymers are listed. Please make list, for example, good solvents and poor solvents for poly-vinylchloride. Then you need to get Hansen Solubility Parameter (HSP) for each solvents. If you are looking Polymer Handbook you can get HSP page VII/698-. (But the values are very old. we do not recommend using them.) If you search in the internet, you may get HSP. If you buy HSPiP official software, it include newest official HSPs. If there is no official HSP, you can estimate HSP from Smiles Chemical structure with using Y-MB. If you ready HSP for all solvents, make the table like below. 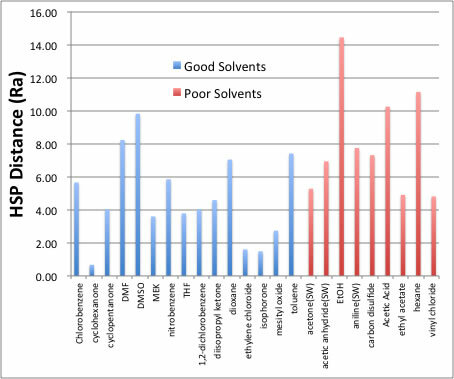 The “Score” column, “1” means good solvents, “0” means poor solvents. Please save the contents (without title) as the tab delimiter file with extension .ssd. Then that file can be read from HSPiP. 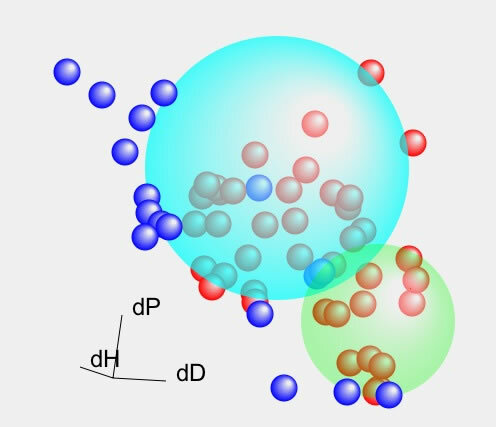 If you have HSPiP, software instantly answer HSP of poly vinylchloride is [dD, dP, dH]=[18.8, 9.2, 6.3] and interaction radius (R0) is 7.3. Suppose you do not have HSPiP yet, let’s try to determine tentative polymer HSP for the purpose to accustom HSP concept. Make the average which dissolve this polymer and use this average [17.7. 7.9. 5.5] as polymer HSP. Then calculate each distance from solvents to polymer from the following scheme. If you plot this results, we find out rules. Ra is 5.4±0.5, then it is uncertain dissolve or not. Less than 4.9 that solvents dissolve the polymer. Above 5.9, it will not dissolve. DMF，DMSO，Dioxane, Toluene, Vinyl Chloride are becoming exception. If the Ra is short, even though it will not dissolve, there are several reasons. For examples, solvent’s molecular size is very large and hard to penetrate into polymer, it is dissolving but it need a lot of time or gaseous molecule and liquids density is very low. 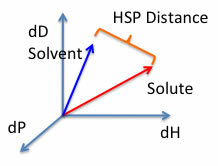 Reversely, HSP distance is long even though it dissolve the polymer. Such case is very hard to find the good reason. But sometime, very few % of hydroxyl group introduction change solving feature dramatically even tough total polymer HSP is not changing at all. Now we did not consider the effect of donor-acceptor in this version, but sometime it is needed. Molecular weight effect, molecular weight distribution effect, Initiator effect, additives effects make complicate the resolvability. But once HSP of polymer is determined, only we have to do is just search HSP distance (Ra) is below 4 if you want to search good solvents. Sometime, the solvents make hydrogen bonding cluster. Such time, dP, dH values are reduced, and even though they are very polar solvent (long distance from p-VCl), they dissolve p-VCl. I made Charge Calculation program for my students. Just draw molecule and push calc. button, you will get charge. 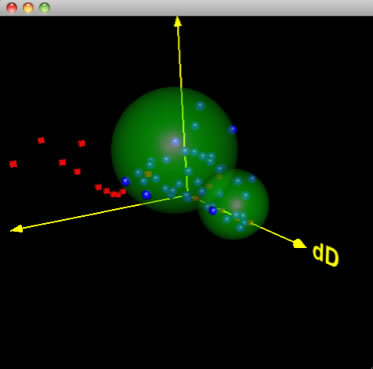 This Program may help understanding hydrogen bonding cluster. On the contrary, if you examine the data with Hildebrand SP, the pattern of good solvents and poor solvents is identical. 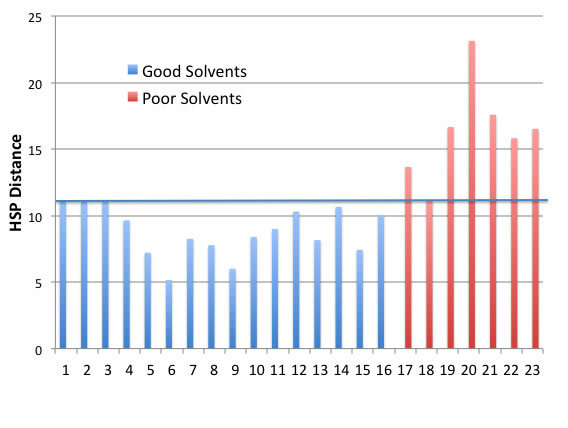 You can not distinguish which (red or blue bar) is which (good or poor solvent) But PVCl polymer SP value is 19.1 and 8 solvents are near to that value. 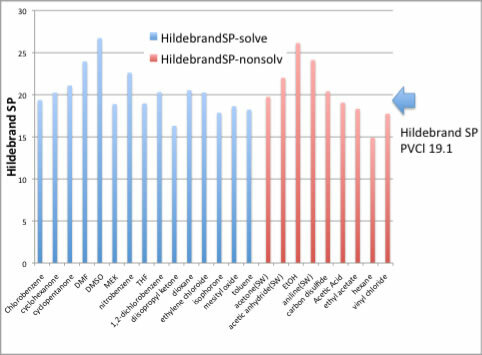 So Hildebrand SP is still using eve though 4 solvents which will not dissolve but near the SP value. If you try new solvent which SP is around 19.1, can you predict solubility with this result? Carbon Disulfide[20.2, 5.8, 0.6] so 50:50 mixture of solvent become [(15.5+20.2)/2, (10.4+5.8)/2, (7+0.6)/2] = [17.85, 8.1, 3.8]. The cursory poly-vinylchloride HSP is [17.7, 7.9, 5.5] so the distance from mixture solvent become 1.74!!. It will dissolve the polymer. HSPiP equip “Solvent Optimizer” and you can easily find good mixture solvents. For example, one of the composition of solvent you are using is very expensive or very toxic, then you can find new solvent or new mixture of solvents very rapidly. If you are interested in these polymer solubility, please refer to e-Book chapter 4. If you want to add new your own solvents into “Solvent Optimizer”, please refer to e-Book DIY HSP (chapter 20). 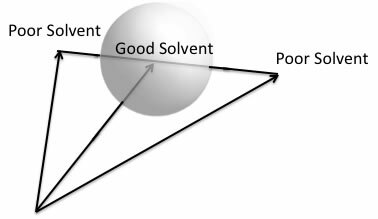 There is no other solubility theory which can treat mixture of solvent theoretically. With next example, we show you Frequently Happening Errors (FHE). Please make the list of solvents list for poly methylmethacrylate(PMMA) from Polymer Handbook. And please search HSP value for each solvent. Then let’s examine with Hansen solubility parameter. If you open the PMMA solvent list using HSPiP. You immediately get the HSP value [19.74, 4.92, 11.5] and interaction radius (R0) 11.1. 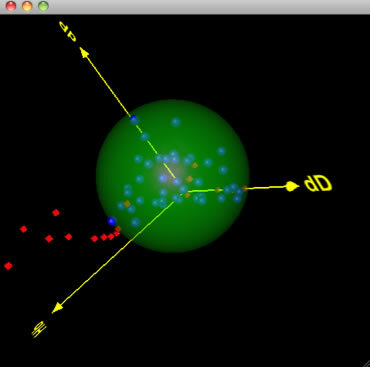 Then you just calculate HSP distance from each solvent and plot them. You can easily find out HSP distance below 11.1 are good solvent and larger than 11.1, it become poor solvents. Do you think so? Actually this is the Frequently Happening Errors (FHE) when you use HSP. The official HSP value for PMMA is [18.6, 10.5, 5.1] and R0=8 (in HSPiP). Why the official value and this Polymer Handbook result is so different? That is the “Diversity of Solvent”. The original Hansen method, he determined polymer HSP with using 88 kind of solvents. Now we recommend at least 16 kind of solvent to determine HSP of polymer. 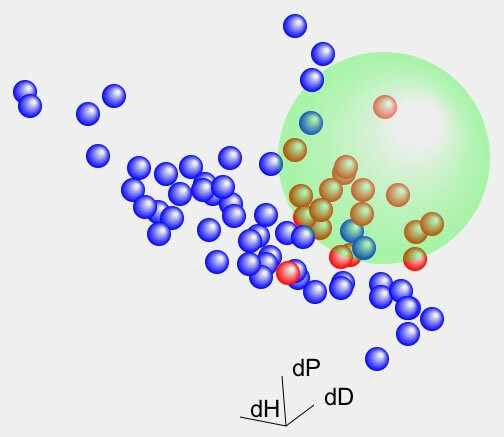 But these 16 solvents should disperse very widely in HSP 3D space. And try additional 3 solvents to confirm the result. If we plot the PMMA example with HSPiP, we can find out the diversity of this test is so narrow. 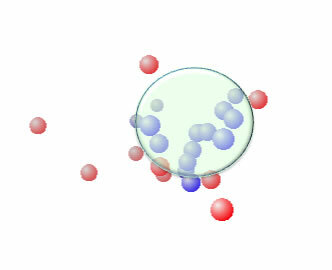 The none solvents (red rectangle) is located opposite side of sphere, and good solvents (blue circle) coming together. The lacking diversity lead HSP result wrong way, but we easily find out which solvent we need test next if we use HSPiP software. Please refer to HSPiP e-Book chapter 3 and 4 in detail. We can say it is very good idea to use HSPiP if you want to find polymer Solvent! 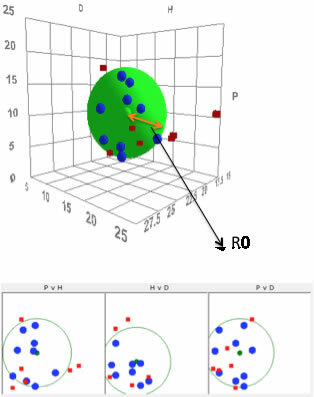 I determined PMMA HSP with new version of Sphere program. I got [17.7, 6.7, 6.2] and radius was 8.96. There were 4 exception solvents out of 57 solvents. HSP can predict Solvent/non-solvent 53/57=93% . 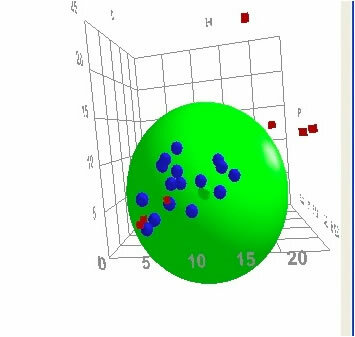 If JAVA 3D is already installed in your machine, please try 3D view of this Sphere. This result is very good. But the reason I revised this article is not for this. When I checked the solubility of PMMA in Polymer Handbook, I found ethanol/water is good solvents for PMMA. I checked this phenomena with HSP. 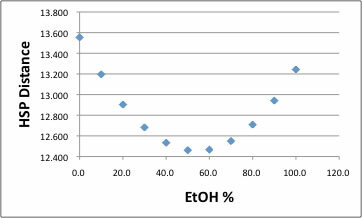 I made Spread sheet file to calculate Water/EtOH solvents mixture of HSP like below table. And calculate HSP distance from PMMA [17.7, 6.7, 6.2]. As show above figure, HSP distance become minimum at EtOH volume ratio around 70%. Even though, HSP distance is more than 13.0 and longer than interaction radius 8.96, so it will not dissolve at room temperature. 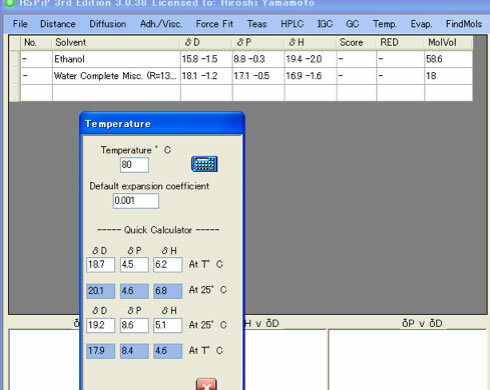 If I change temperature 25 to 80 C, the minimum percentage of EtOH become 50%. And the HSP distance become much shorter. The temperature effect to HSP need check again. And EtOH/Water system, there are very large heat of mixing exist. This heat of mixing is not accounted in this study. Even though, we can get a lot of suggestion from this calculation. Hildebrand SP can do nothing for this problem. If you are interesting in, please read these articles. Electric Conducting Sulfur Containing Polymer for Solar Cell. Cleaning of Mold Release agent from polymer. 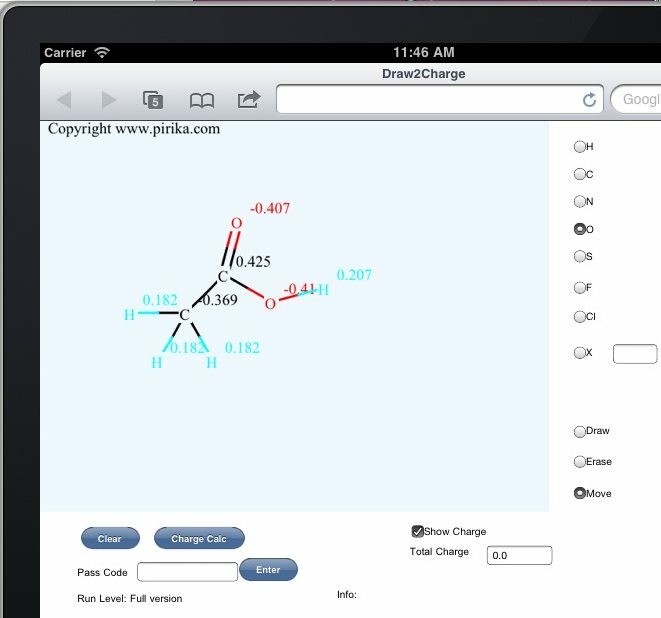 If you want to know about radical initiate co-polymer, please visit Pirika site.